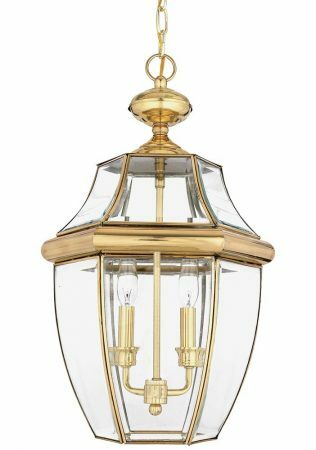 The Quoizel Newbury 2 light large hanging outdoor porch lantern in solid polished brass is rated IP23 and boasts bevelled glass and classic style. Featuring a ceiling mount, chain suspension and large hexagonal lantern, with top ring and large top finial, concave clear glass upper panels and curved lower panels. A two light mini candelabra stands inside, with candle style lights, candle drips and short candle tubes. The polished finish will age over time if not maintained. Outdoor lighting plays a large part in creating a special ambiance and the Newbury outdoor porch chain lantern has it in spades. The classic design, bevelled curved glass and solid polished brass gives the outside of your home a rich elegance. It is a versatile look that coordinates with almost any architectural style. This exterior light is supplied by Elstead Lighting and designed in the USA by Quoizel, founded in 1930 in New York. 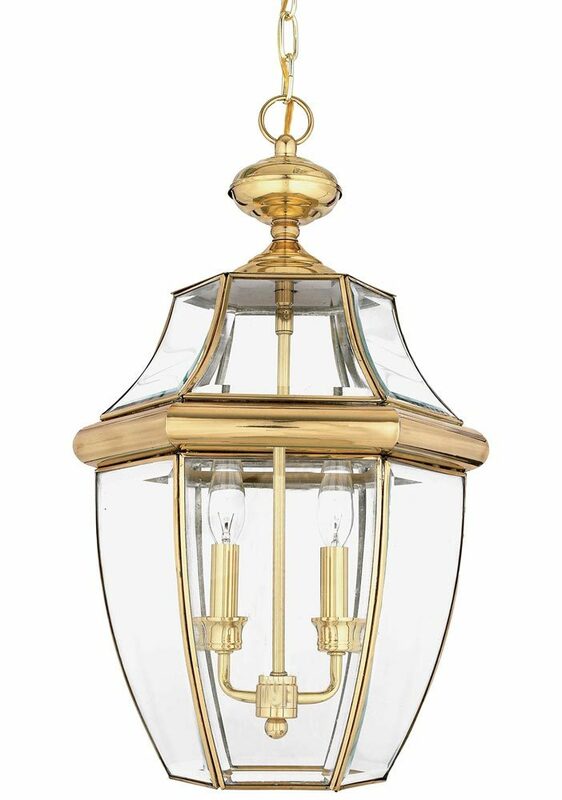 Their designs embody a history of being artisans in glass and natural materials that illuminate your living space and enhance the beauty of your home, such as the Newbury 2 light large hanging outdoor porch lantern in solid polished brass and rated IP23 featured here.